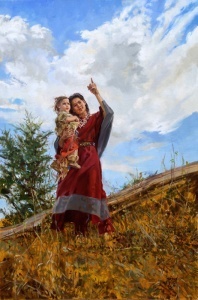 Artist Barbara Summers Edwards’ oil painting titled “Wonders of Heaven” won the Plainsman (People’s Choice) Award at the recent American Plains Artists Signature Show which was hosted by the Preserving Arts in the Osage organization in Pawhuska and Osage County, Oklahoma. Edwards hails from Smithfield, Utah. The public is invited to see this and other award winning artworks and view the entire show online.